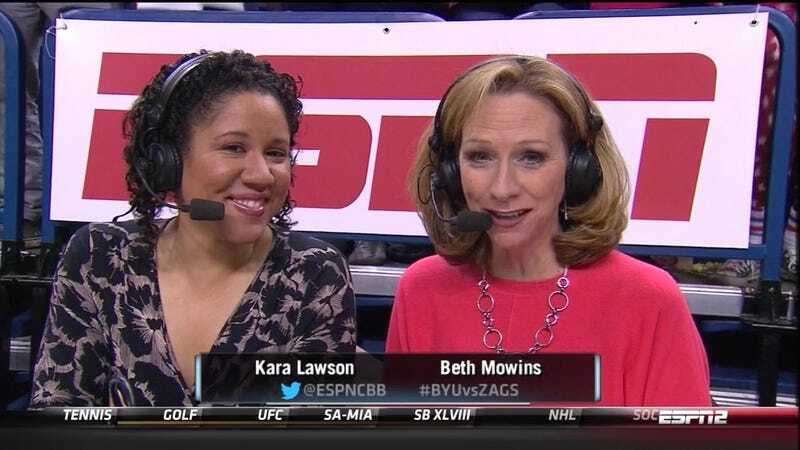 Beth Mowins and Kara Lawson handled announcing duties for last night's BYU-Gonzaga game from Spokane. Mowins is one of ESPN's best on the play-by-play mic, and Lawson is an established star as an analyst. Turns out a lot of brain-damaged misogynists had a problem with basketball knowledge being spat at them by smart, capable broadcasters who happen to possess vaginas. Here are some of the stupid things those people said. Enough morons. Here are some people with functioning ears, and the contents between them.